Kerrigan Kerrigan simply cannot absorb the damage of Artanis, she will be overwhelmed very soon if you lane versus her. Sgt. Hammer Sgt. Hammer can be a pain sometimes, when he is hiding and well protected by his team he can deal quite heavy dmg. But unluckily for him, one fast combo can take more than 40-50% of his HP, with some help from the team he will explode fast. Tyrael Tyrael is a bruiser with decent damage and very high mobility; he will probably not even consider you in teamfights, everytime you have the chance, punish him because he only has 1 defensive shield, while that is not active he goes down fast. The Butcher Butcher relies mainly on his strong self heal while dealing damage, when you see he activates the skill try to avoid his attacks or cc him, after that focus him hard because the CD on his heal is long and he can't absorb much damage. Greymane Greymane has a deadly burst on paper-armored heroes, he can be dangerous also for you if he catches you without the shield, he must be main focus when he is in worgren form! Li Li LI LI can be tough to be taken down for ARTANIS this is mainly because of her AoE blind and her passive skill which gives her movement speed when she suffers dmg. Focus her always. Johanna Johanna is very annoying due to his blind and kockback skill, she is not really a menace for you but it can be very annoying to have her around during the teamfight. Thrall THRALL is very similar to the way we build and play ARTANIS his W is very similar to ours, hiw Q is a direct damage spell, our Q is a melee skill with similar range but higher dmg, his passive gives him sustain, our passive protects us; Both played by pro players, ARTANIS wins on the long run for sustain. Artanis is not a Tank for(at?) all, he totally differs from his other colleagues. He is not tough like Diablo Johanna Muradin he has not heavy crowd control like or Anub'arak or E.T.C. and he is not even a real bruiser like Sonya or Tyrael. 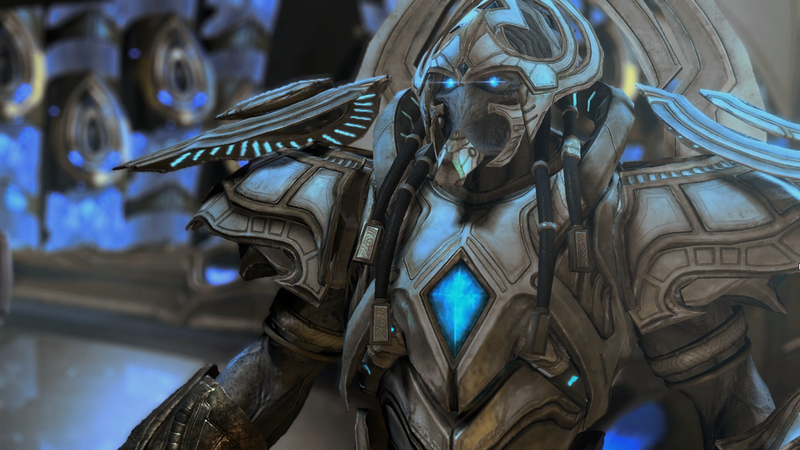 In poor words we could say that he is more similar to a tougher version of Thrall or Zeratul with slightly less damage.. but that is not totally true, Artanis can indeed be a top damage hero as well as absorbing damage for the team! [*] Without any doubt very funny and strong warrior to play. [*] Awesome duelist - He can beat anyone in 1vs1 and later on 1vs2. [*] Strong autoattack and Blade Dash can clear waves very fast. [*] Can dodge enemy skillshots or CC with a well timed Blade Dash. [*] Can clear mercenary camps alone and fast, without losing any HP. [*] His damage is mainly single target but his Purifier Beam & Blade Dash are AoE. [*] Both ultimates have global range, you can cast to/from everywhere. [*] Shields are great at wasting enemies mana while absorbing high amount of damage. [*] Blade Dash can hit backliners and later on reset Shield Overload CD. target at the right moment. [*] if you're playing duo or Team League, Purifier Beam can deal a lot of damage if coordinated with other's ultimates stuns or roots. [*] Artanis only has his Phase Prism which is not a real CC at all. [*] Brightwing can nullify Artanis if he decides to always use Polymorph on you. [*] Sometimes you will get focused hard if the enemy understands you're dealing more damage than your others. [*] Purifier Beam can be easily dodged by most champions, sometimes you will just waste it. [*] Artanis can suffer from certain setups with double blind like Li Li,	 Johanna! they can drastically reduce your damage output. [*] With this build you very offensive and you can absorb the damage of enemies quite well but if you have extremely squishy champions like Cromie, Li Ming, Kael'thas, you won't physically be able to protect ALL of them togheter. Right now in the current build (July 2016) Artanis is considered a "Bruiser", he is not in the top tier hero list, but if properly used he can do even better than the most common OP picks, and I'll try to show you how and specially why... Artanis has a poor health pool compared to other tanks out there but he has a unique passive Shield Overload which gives him a lot of chances! and out of the 15 Tanks available in HotS, Artanis and Sonya are the two heroes with highest damage followed by Arthas and Diablo then we have Anub'arak and Stitches. Artanis has the potential with this build to deal the same or even more damage than heroes like Jaina,	 Raynor,	 Thrall,	 Kael'thas and absorb an immense quantity of damage because of his offensive nature, enemies will be often force to focus you and not your healer/dps. Artanis relies on his strong basic attack added to a various skill package that offers 2 offensive skills, 1 crowd control skill, 1 passive defensive skill and his offensive ultimate. Q	 Blade Dash can hit mutliple enemies, 65 mana cost. <-- use only with 2+ enemies. W	 Twin Blades main damage ability, high damage, reduces CD of shield. 25 mana cost. <-- use ALWAYS. E	 Phase Prism swaps positions and resets autoattack at the cost of 70 mana. <-- situational use / rare. R Purifier Beam evokes a beam from the skies that attacks an enemy and chases it slowly. You can survive a lot in the lane but you must not abuse of our skills, because Artanis doesn't have a source of mana sustain.W costs 25 mana only, you can stay far from your base for quite a while if you use Q and E wisely, instead use W on our rival every time possible; our goal is to fight in a situation where the enemy or both of us are wounded (40-70% hp) also not full mana would be better but it's not crucial, this situation will give us a great advantage! Our Shield Overload will come in our sustain. You will be able to perform a full-combo at level 7 with one of your core talents Psionic Synergy. Now 1 basic attack + Twin Blades + Blade Dash will be enough to reset Shield Overload! This means that if you engage with a fresh shield, you are virtually covered for 2 shields while doing a lot of damage; From level 7 you can start enjoying your build, indeed now you have the burst power to gank them easily if they have around 40% HP, also if you miss Phase Prism. At level 13 your Twin Blades will hit for 3 times instead of 2 making the combo even more powerfull! 185 (B.Atk dmg) x 4 = 740 + 95 (first Q wave) + 285 (second Q wave) for a total of 1120 damage in 1.8 - 2.5 seconds, while being protected by a 748 shield for the first 2.5 seconds and get a NEW FULL 748 HP shield at the end of the combo! 1120 damage in 2 seconds is a lot, at that level Zagara has 2430 HP, Jaina has 2320 HP, Nova 2000 HP, Cromie 1866 HP, you can take 40-60% HP of a squishy enemy in a bunch of seconds! go back and strike again a few seconds later! All this while being protected by a shield. will help you a lot, at a certain point your shields just won't end with this build setup, just remember to ALWAYS use basic attack and Twin Blades when possible. He is the hardest and only real counter of Artanis due to Polymorph, a well timed one can mess up your shield mechanism and let you die real fast. She is not a menace for us personally but she will slow us a lot, we must ignore her and hit only if we badly need 4+ CD reduction on shield otherwise leave her last. Her Blinding Wind combined with Fast Feet makes her pretty strong versus all melee champions. When fighting her make sure to wait for the blind to end before using your W, this can make the difference between surviving and dying in our case (	 Shield Overload). Can give us a nice boost to damage, attack speed and even a small shield! Pretty similar to Illidan combo. Artanis becomes a war machine with Stim Drone! But Lt. Morales life will be hard healing you because of your mobility. His Bone Prison can be of great help for us! It will give us the time to land probably 1-2 basic attacks, Twin Blades and finally Phase Prism, if an enemy is below 40% health he will very likely get killed. Huge damage and good root with Feral Spirit! focus the same target and your combined burst will be devastating! It may look weird to have both Artanis and Sonya togheter, but if both properly played they can take and deal back a huge amount of damage. Entangling Roots and Innervate can be really usefull during the 15-25 minutes of match! Also his heals over time added to your shields make a good combination. This PASSIVE SKILL is Artanis core! At level 1 it absorbs 467 Damage (20% max health) which is quite a lot! This shield will be our best friend without it, in the middle of enemies we are dead meat, but luckily with the help of talents and our way of playing Artanis it will be active everytime we need it! This skill is your secondary source of damage, it can be quite usefull later on for various reasons: the main one is to poke multiple enemies togheter, to proc your passive, to dodge enemy skills. The backside of this skill is the reason why we will NOT BE USING IT much early in the match, it costs 65 mana which is more than 10% our mana pool which will get dry very fast if we use Blade Dash early when it still has no talents spent on it. This skill is your primary source of damage, thanks to this you will always land back a high amount of damage also if poked by a short-mid ranged caster, use this also to dash in the direction you want, for example when fleeing, you can activate it and attack a minion behind you to jump there, or the opposite if chasing an enemy. Also it can save your life very often because of CD reduction on Shield Overload. Another use of this skill is to activate it immidiately after/before your E Phase Prism to reach targets behind the first line and then also land a Blade Dash if needed. This skill has a very poor range and it can also be double-edged, if you fail to use it, you might find yourself in the middle of 4 enemies that could destroy you fast. On the other hand this is your MOST important tool for ganks! Ganks you will be asking? Yes, because Artanis has a very good gank potential! his Phase Prism can reposition the enemy in the middle of your team, reverse or deny a teamfight, remove enemy from an objective or simply slow down the flee of your prey, put the enemy tank far from your carriers! Artanis' ultimate evokes a beam that attacks and slowly chases an enemy hero, this skill can be potentially deadly if used properly and with the good setup. Purifier Beam works great with Jaina's	 Ring of Frost,	 Xul's	 Bone Prison	 E.T.C. 's	 Mosh Pit,	 Nazeebo while evoking Ravenous Spirit, Sgt.hammer can't be static in tank position, Malfurion and Lili are forced to move and may cut out people from their ulti's range, it can be also quite good on Illidan,	 Sonya or if the enemy team is composed by many melee in the middle of them. Otherwise just on a random enemy hero that will be neutralized and won't deal damage in the fight for a 4-5 seconds. Level 1 Talent: You will be mainly using Q-W and your basic attacks, this exposes you to a lot of incoming damage, this talent will grant some toughness. Level 4 Talent: You will be always in the middle of the battlefield, Templar's Zeal will be active almost everytime because if you didn't understand that yet, Artanis lives of fights, he will always be fighting most probably with less than 50% HP, so basically your Q will have 5 seconds CD instead of 10 seconds. Level 7 Talent: This is one of the most important talents of Artanis; Your Q at this point of the match already has 5sec CD reduction when below 50% HP, now for EACH enemy hero hit, it will reduce the cooldown of the shield by 4 seconds. Potentially in the best situation possible, you could hit 5 enemies twice with one Q. Also with this talent you can instantly reset Shield Overload CD by using B.Atk + Twin Blades + Blade Dash combo. Level 10 Ultimate: Artanis has 2 nice ultimates, both of them have global range but work differently; The beam will deal decent damage and chase the target that will most probably run back and be zoned out of the fight, the Circle will blind all enemies in a wide circle area for 4 seconds. BOTH ARE VERY GOOD but totally situational, if you are fighting versus a team with a heavy damage made of many autoattackers like Raynor, Falstad, Thrall or bruisers like Sonya, Anub, Tyrael the circle could be the best choice but on the other hand the beam can be deadly if your team can block/slow enemies a lot; Anyway if you take Purifier Beam it's never a mistake. Level 13 Talent: At this point of the match you have to make another choice; both Phase Bulwark and Triple Strike are excellent. Phase Bulwark will reduce for 4 seconds (out of 5 the shield lasts) the damage from enemy hero abilities, this means that while protected by the shield you take 50% less damage, pretty solid pick. Triple Strike will let your twin blade hit 3 times instead of 2, and reduce Shield Overload CD. They are both defensive, while the first one gives you a global protection, the second one will let you have the shield active more often and a little higher burst. I suggest the second one if you want more damage and the first one if your team already has a good damage output. Level 16 Talent: This talent doubles the amount of your shield for the first 3 seconds out of 5; You gain a huge amount of survivability, if before 1vs1 was easy now you can even take 1vs2 and kill both enemies without losing HP but only the shield. Level 20 Talent: Your attacks will deal 20% extra damage and slow enemies movement speed by 20% for 1 second. This is really a great boost to the already lethal arsenal of Artanis, you hit harder (double/triple bonus on W) and slow the enemy! Hello there guys, I am a huge fan of videogames, my passion started when I was really young.. when the PC were not even so common.. anyway I was born in 1989 so I am not that old :P. I played all the main MOBAs out there or at the least the most important ones..(LoL, Dota2, HoTs) I started playing HoTS at the closed beta stage, I didn't play for 2 months only untill today. In the old rank system I was rank 2, right now with the new system after the placement matches i qualified for Gold but after a few days I moved to Platinum. Right now I am working a lot but I'll keep the guide up-to-date and possibly move to Diamond very soon. I like to play all roles but mainly I prefer Tanks and Assassins.